Hi guys. I have an unusual problem and am not a tuner by any means but am generally pretty good at understanding instructions. I have a link PNP in my altezza factroy ecy box. Have had it dyno tuned and set up for over a year and ran with no issues. Last week I removed the intake plenum and throttle body to polish the plenum and paint the throttle body. I did not removed the FPS or TPS from the throttle body, merely unplugged them and covered them up before painting. I also cleaned the butterfly valve inside with degreaser. After i reinstalled everything I started car (a week later) and it shot up to 3500 rpm and then dropped to 1500rpm and then continued to bounce between these rpms until i shut it off. A CEL came on so plugged in pclink on laptop and showed error code 75. Had a poke around to make sure everything was plugged in and then started it again,then error code 76 came on as well. Cleared the codes and took it for a short drive and it continued to rev to 3500rpm with no accelator pedal input, almost like it was on autopilot and would drive itself. I performed a tps calibration and calibrated with no problem.Started it up and it went jumpy and had a very fast idle between 1500-2500 rpom and sounded like it was missing lots. Have done some reading on here and seems like it went into a category 2 fault? Went back to it tonight and now shows two more errors, codes 23 and code 26 both to do with the tps. Also note that for the last year or so the ethrottle motor has made a constant wine noise when key is in the on position. I cant help with your main issue, but if you want the throttle body to be less noisy when the motor isnt running, changing this setting to "Quiet throttle"
no vacuum leaks on the plenum? Thanks david I will try that feature tonight to try quieten down the motor. And I have checked for vacum leaks as I also thought this might be a cause. But for it to rev up to 3500 it would have to be a massive leak? I briefly removed the vac hose thats underneath the throttle body whilst it was running and that increased the revs more and made a hissing sound so I knew what to listen for etc but cant hear anything else like that. Im still thinking maybe some degreser has gotten into the sensor? Was going to bring up the tps sub and main on a graph and see if they follow each other nicely. the degreaser or water in the TPS is definitely a feasible reason for this to occur. However I would strongly suggest also carrying out a full DBW recalibration procedure. Recalibrate the FPS and TPS from the DBW section of the software. Do not do a TPS calibration from the ECU CONTROLS TAB as this will only look at TPS main. With the ethrottle in setup on mode, the throttle blade started to oscillate rapidly just by switching it to the setup mode. Then i did the fps calibration. This worked fine and calibrated fine no issues. Then i tried the TPS calibration. It did the tps main fine and i could hear the motor turning the throttle plate open, and then it calibrated closed fine as welland i could hear it shut. Then it did the tps sub and again i coud hear it open and shut fine. I see David on the other altezza post is having a similiar issue? I wouldnt touch any of the other settings apart from calibration if they previously worked fine. It's possible that your TPS has crapped itself from some CRC or whatever getting into it though. David , just been trying it again. Undid the screws and adjusted it slightly anti clockwise, same thing error 16. Continued adjusting it and recalibrating fps and then tps each time, same thing error 16. Maxed out anti clockwise with error, so went full max clockwise and same thing error 16. Never got the 'tps sub limited movement'. Each time the fps set fine and tps main and sub set fine, just when the main vs sub came up it was very erraratic and failed. Im taking this as the tps has died so getting a new one tomorrow. Pulled tps off and couldnt see any signs of moisture tho, pins looked clean and checked all teeth inside throttle motor mechanism and all fine. So fingers crossed new tps fixes it. What do you think about not getting the limited movement error even tho I maxed both adjustments out? Hey Brendon I found this document which might help, part way down it lists the TPS voltages you should see. If you press F12 while connected you can see runtime values, one of the screens shows you TPS voltage. Check if your TPS is near these voltages when closed and open. One trick that can help when doing the calibration is to lower the PID gain values to give a slightly less sensitive response. Also need to be sure the voltages track nicely. There should be no dips or spikes as you progressively open the throttle. Hi simon, Have had chance to do this quick log this evening. See how the tps sub and main actually cross paths and both end up at 100 percent at WOT?? surely that shouldnt happen as they dont seem to track each other at all. Whereas the fps is fine. Also, I cant get the tps main voltage below 1.01v even with adjusting the angle on the throttle body. I have read from forums it should be around 0.78V and this is consistent with the factory values given in the pdf linked above by david. What are your thoughts? I have a new tps arriving on friday to check against as well. Also remember that all wiring is factory with a plug in board, that has been working for over a year and i have no made no pin reassignments etc. Surely Faulty tps? I tend to think a sensor or wiring issue. Given you voltage is sitting high check the 5V supply is at 5V and not being pulled up some how. Check the PC link runtime for the ECU internal 5V and make sure this is very close to 5V. If its high then there could be a 12V short on to the 5V output of the ECU. They should track on top of each other. If there is a % offset it will throw a fault and throttle will shut down. Hi simon/ anyone experienced to help me, I have put in the new tps sensor tonight, set tps main at 0.78volts using pins 023 and ground,did fps calibration fine and then got target 98 percent could not be reached error. So i adjusted the angle down so tps main was around 0.68v and the fps calibration went fine and then the tps calibration went fully fine as well. I then saved changes and started car with no errors showing, but then same thing as initial, engine revved up to 3500rpm and then sits there and then drops to 2800rpm and then just bounces in between. If i touch the throttle it will rev even higher and no error codes.Surely this is just a settings issue now to get the rpm back down to around 1100 (which is what is was doing before all of this started)? 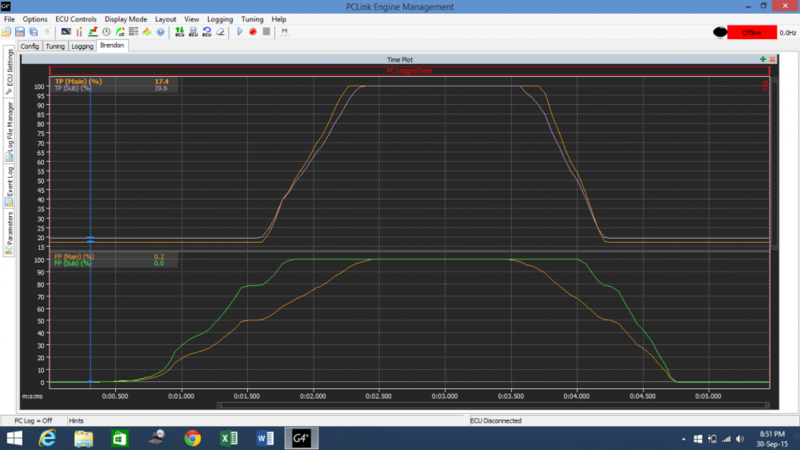 I have attached my pcl file if you could take a look at my ethrottle values. I havent altered any of the pid settings. Only done the tps and fps calibrations. Once again, im not a tuner merely learning as i go and trying to solve this at home as tuner is a 3 hour drive away. Note: i havent changed the fps (100%) Value. Should i have done this after the fps calibration/ could this be affecting the idle speed? thanks, it still could be so will do one when I next get the chance, very frustrating! Turn OFF any idle control setups so that you are dealing purely with the DBW and have no other external influences effecting your setup. Example at 900 rpm and 0% FPS you may need a value of 1.5 - 2 % for it to idle. Hi dave, can you just run me through how to turn it off? Ive gone to the idle setup section but no options to disable? Only options for open and closed loop etc. As this sounds like a good thing to try just to see if it will stop revving high. I have also noticed at 8000 rpm you have Throttle Blade angles set to 2 % all the way down to 100% FPS. Be very careful doing this as it gives an very abrupt limit to the engine, the kind that wants your face to plant through the windscreen. OK so we have made some improvement, however the idle speed you are suggesting would be a massive leak, to idle that fast. In saying that you would also expect the MAP to be very low and the engine run rough due to leak if tuned via MGP or MAP, however at such high rpm the engine may have enough vacuum to not create an issue. When the engine is idling at such a high speed , can you remove the intake and see how far open the throttle blade is. Also make sure no one has drilled a hole in the throttle blade as some brilliant mechanics choose to do to correct idle speed issues. Hi dave, I checked for leaks bit could find none, used various methods including propane and carb cleaner etc, nothing I could find. Dont have access to smoke machine as such. So yes still maybe a throttle body/ecu settings problem. Im taking car to tuner this weekend so will post up his findings, very interested to see what exactly it was. Im not running factory maf meter, its setup with map and iat sensor etc. (3sge plus t). Vac inhg gauge read -20 when idling at 1800 and then dropped to -18 when engine speed would increse to 2000 rpm, and then just fluctuate with idle speed change. Will check the butterfly position when idlong and let you know. It hasn't been modified in any way from factory. 20 " of vacuum at idle is perfect, even at 1800 rpm it is still indicating to me there is enough restriction to flow to generate a good vacuum signal. So does this actually have an idle speed device or does it just have DBW. In my previous instructions I disabled idle ignition timing table and that way the engine runs on the main table. What is the idling ignition timing value from the main ignition table. Some ford DBW have a plastic bypass adjuster, just wondering if yours has anything like this. What is the AFR value at the high idle speed. Brendon with all of the idle control settings set at 0 etc like previously mentioned , put 0 in the DBW target table in the 0 to 10% FPS Y axis and all rpm sites in the x axis does the engine still fast idle and have a lo9ok at how much throttle blade is open. Yes there are stopper screws on both sides of the TB. So for the FPS and also for the throttle blade angle itself. If these have been adjusted then it could cause issues. I guess a way to rule out the Ethrottle from your idle issues. Is just turn e-throttle off in the ECU. Then start the motor and see what it idles at. If the idle stays the same, then either the plate is a bit stuck open or there's still a vac leak somewhere. If your engine idles lower, then you know it's something to do with what the e-throttle plate movement is doing. I'd maybe check if the TB is closing all of the way properly. also for the ethrottle table if it's still (by default) set to 2% at "closed" maybe try set that to 0%. so if it's still set to 2% that might be contributing perhaps. I will check the table values again, and also try turning off e throttle and see if it will run..
All my vac lines are secure, The top one i use for gauges and bov, bottom one is used for the fuel vac line and i have my map sesnor for the ecu board teed into this line as per installation instructions with the link pnp ecu board.